Ready to attach tasbih top. You will simply attach the two ends of the thread carrying the beads to the two loops at the bottom of the imame. Ottoman tulip symbols encircle the imame and the end bead. 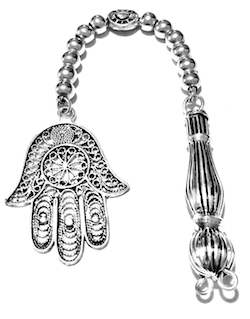 The top attachment features bright shiny 5-mm sterling silver beads carried by a Turkish silver fox-tail chain. If you want to hide the end knots of the thread then you must use the knot holder crimps shown on the last photo. Check the related box under Product Options to add crimps. Use to create museum grade tasbihs. 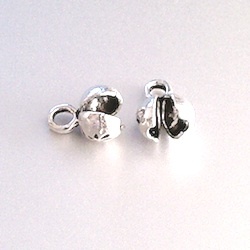 Suitable for beads 9 mm and larger.